Sunday, June 18 from 1-5 p.m.
Eartheart Gardens (207) 619-2836 or by email: info@EartheartGardens.com. Coming from the south take the Maine Turnpike. Get off at Exit 52. Take Interstate I-295 north to Exit 28 (Brunswick/Bath). Go about 2 miles to a big overhead traffic sign, indicating Route 1 to the left and Pleasant St. straight ahead . . . Continue straight ahead to its end at Maine St. . . Turn right onto Maine St. and drive ¼ mile, crossing railroad tracks . . . Turn left after a gray/white church . . . Skirt Bowdoin College campus to overhead traffic light . . . 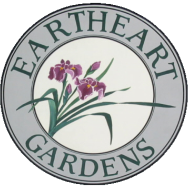 Turn right onto Route 123 . . . Eartheart Gardens, 12.4 miles on left, you will see our sign. Coming from the west through Lewiston: Take Route 196 from Lewiston to Brunswick. Continue on Maine Street to the big gray/white church and follow directions as given above. If by Route 1 through Bath get off at Brunswick, find your way to Maine Street and follow directions above. If coming from the “east” or “southeast”: You had better be in a boat!